Where do you find inspiration when you travel? Perhaps it’s food or maybe it’s entertainment. For me, it’s hotels. 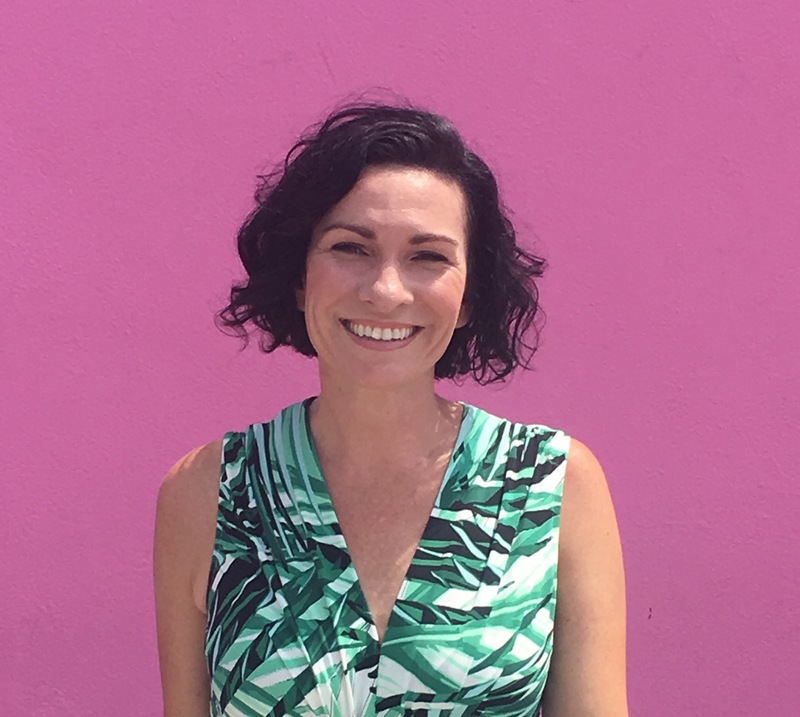 Design is one of my passions that I don’t feed as often as I’d like so when I go to another city, I always try to find a special place to stay that will inspire me to decorate or renovate at home. 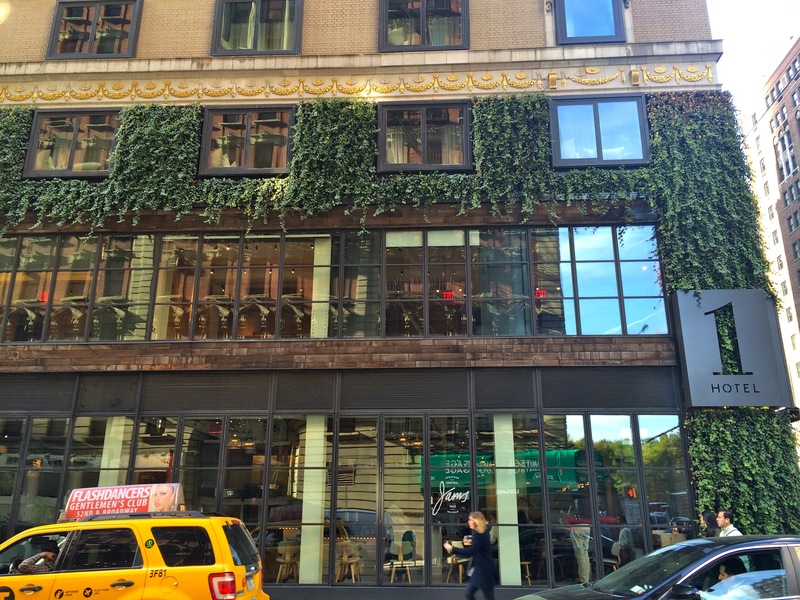 What is it about cities that inspire us so much? I think it has something do do with our inner yearning for beauty and accomplishment. Cities couple those things together so well. My husband, who is a Pastor, said something this week that I thought was interesting and that is “we started out in the Garden of Eden but we will end up in an eternal city”. If you think about it, cities are places where people and technologies and culture and diversity all come together as expressions of the inner creativity that’s been placed within us. Maybe that’s why they inspire us so much. 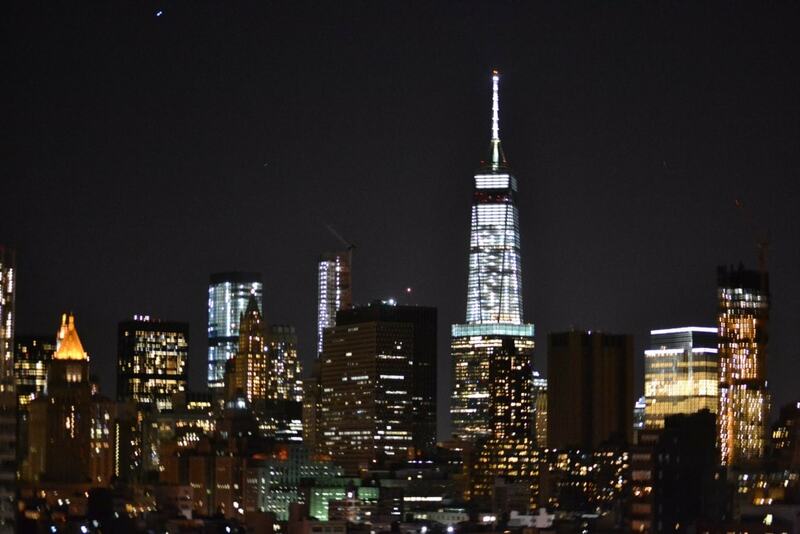 No place inspires me more than New York City. I spent 20 years working in advertising which brought me to New York 2-4 times per year so I have visited the greatest city on God’s green Earth no less than 40 times! 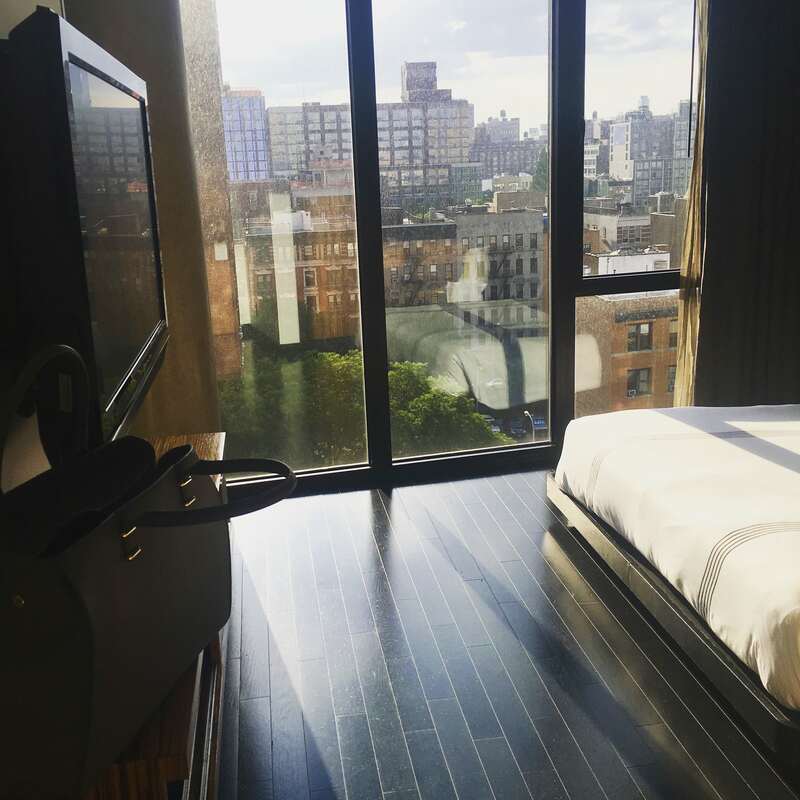 I stayed in many different hotels throughout different parts of the city and have narrowed down my list of favorites for you based on those with the most inspiring design and exceptional experience. 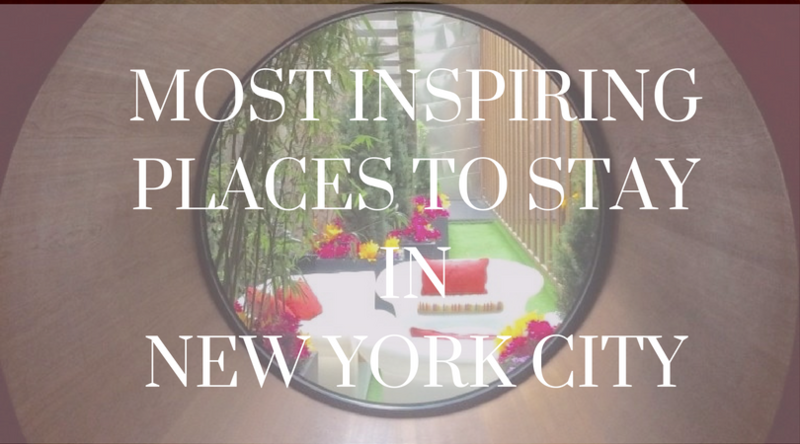 Here are my top 5 most inspiring places to stay in New York City by part of town. Midtown is notably missing from this list because my favorite hotel there, The Waldorf, is actually under renovations until 2019. 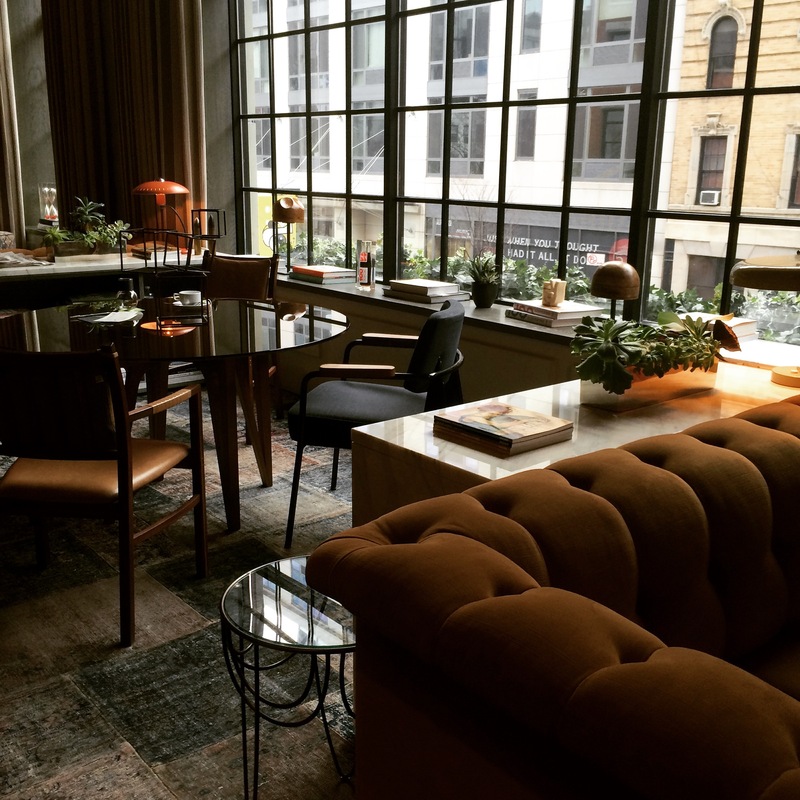 I first heard of the Sixty Soho a few years ago from Chiara Ferragni of the Blonde Salad, and as always her advice did not disappoint. 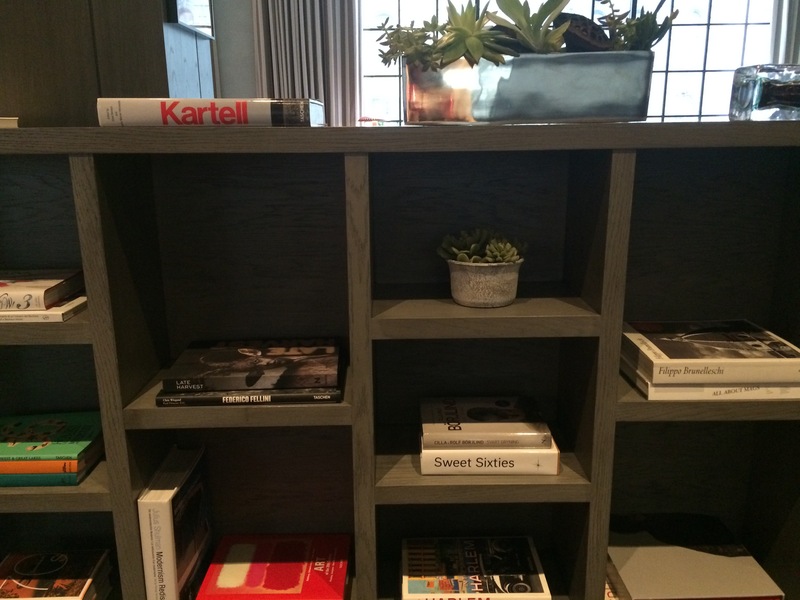 This boutique hotel has a fabulous library and lounge area that is NY loft meets cozy study. 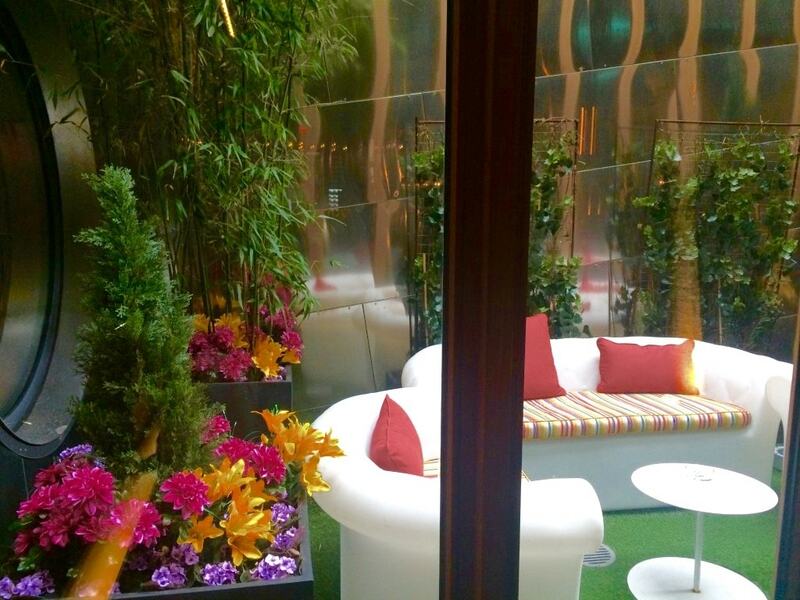 It is an inspiring place to have breakfast before your long day ahead or unwind over a cup of tea before bed. Think what you will about President Trump, the Trump Soho is hands down the most amazing Hotel experience in New York. The bellman knows your name when you step out of the cab. When you walk in the lobby, the scent is intoxicating. Luckily they bottled it so you can take it home if you wish (Wanderlust by Red Flower). Upon check-in you’re greeted with a lavender towelette and bottle of water. 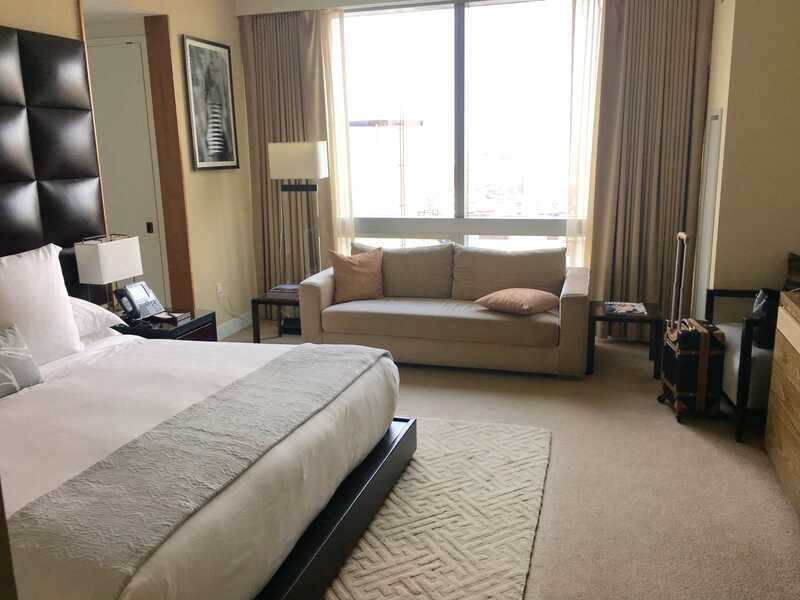 Once you step into your room you immediately notice that it is much larger than a typical room in the city. 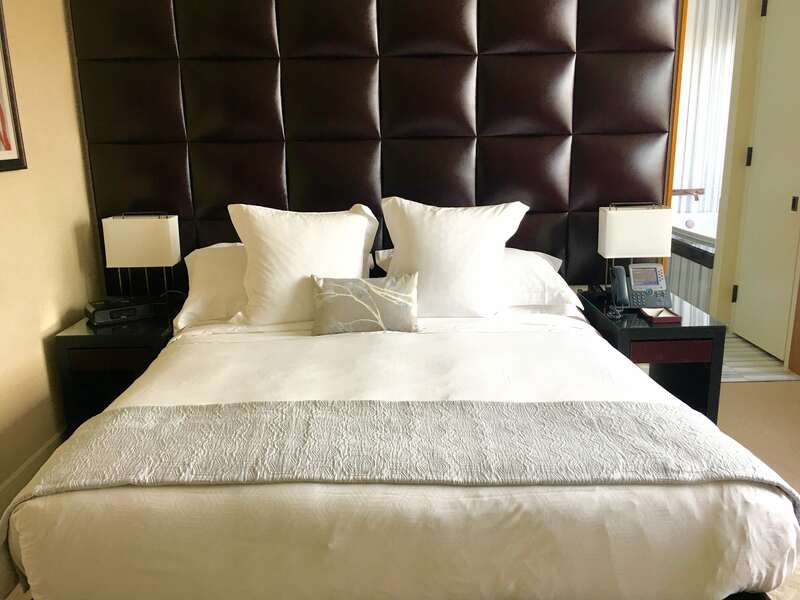 The bed is the most comfortable I’ve ever slept in, including my own bed at home, and I have a super luxe bed, so finding something comparable when I’m on the road is not an easy feat. The rooms feature automatic shades that open and close with the push of a button allowing for sleeping and waking to magnificent views. 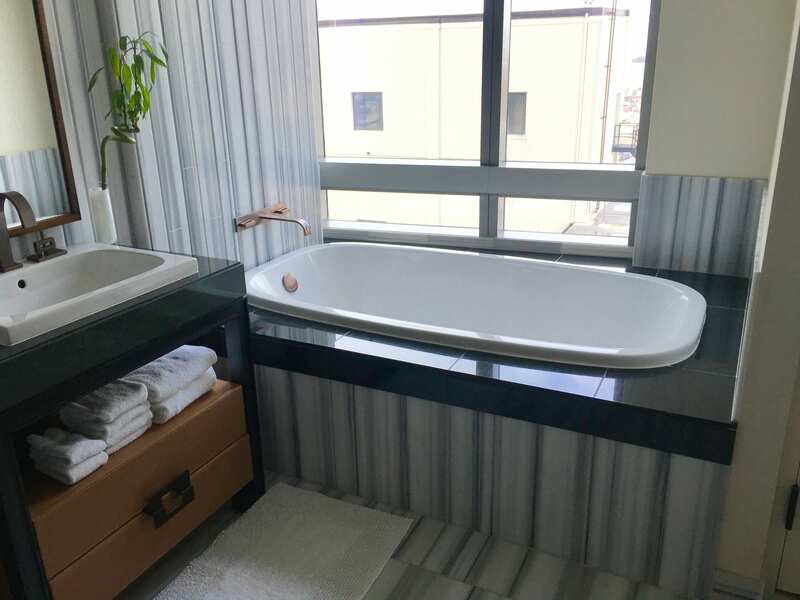 Last but not least, the Trump Soho offers an exceptional bathroom experience with marble tile floors and a sunken tub with a window overlooking the city. There is a separate shower, his and her sinks and a TV on the vanity so you can get ready while watching your favorite morning show. Luxury at its finest and a designer’s paradise. The natural wood and greenery brought into this hotel makes it feel like you’re on a retreat from the bustling city around you. 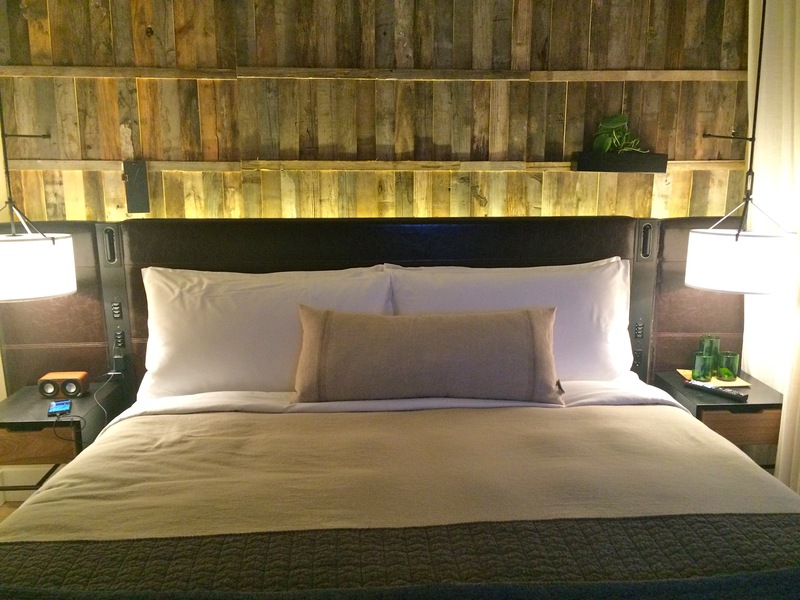 The beds are cozy and the robes are super luxe which makes you want to linger a while and enjoy room service. 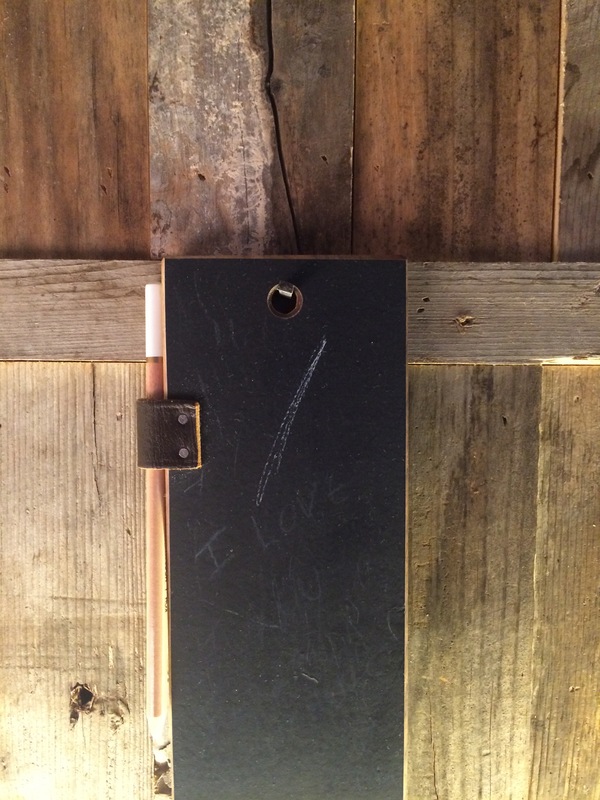 They have chalkboards on the headboard. An eco-friendly design idea for those thoughts that wake you up in the middle of the night. 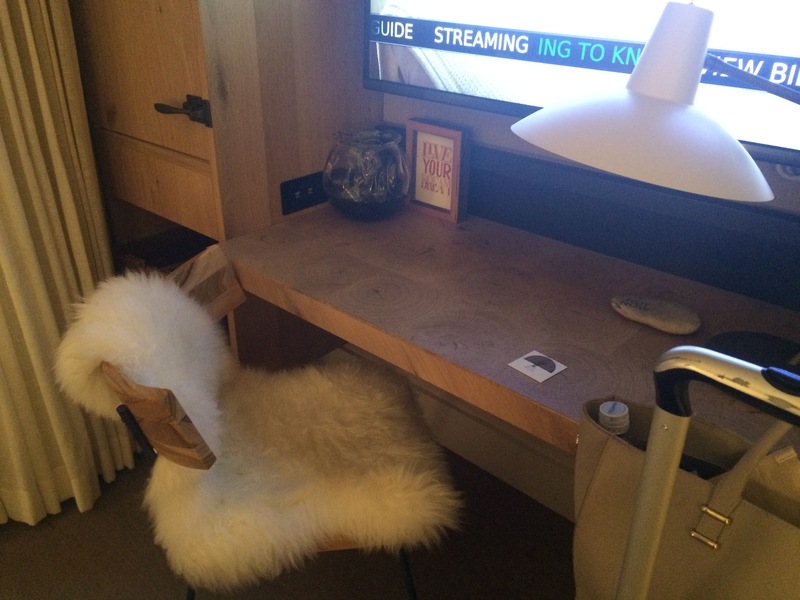 A fur desk chair is another adorable feature of the room. 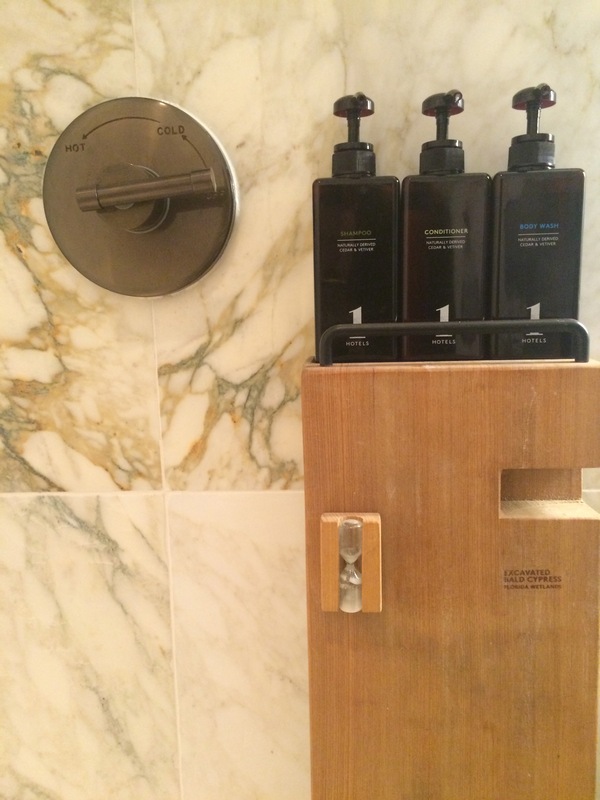 The bath features full size amenities, a welcome treat for a weary traveler who does not want to waste time trying to pound out their shampoo and conditioner from those tiny bottles. There is also an hourglass timer so you can make sure you don’t spend too much time in the shower. 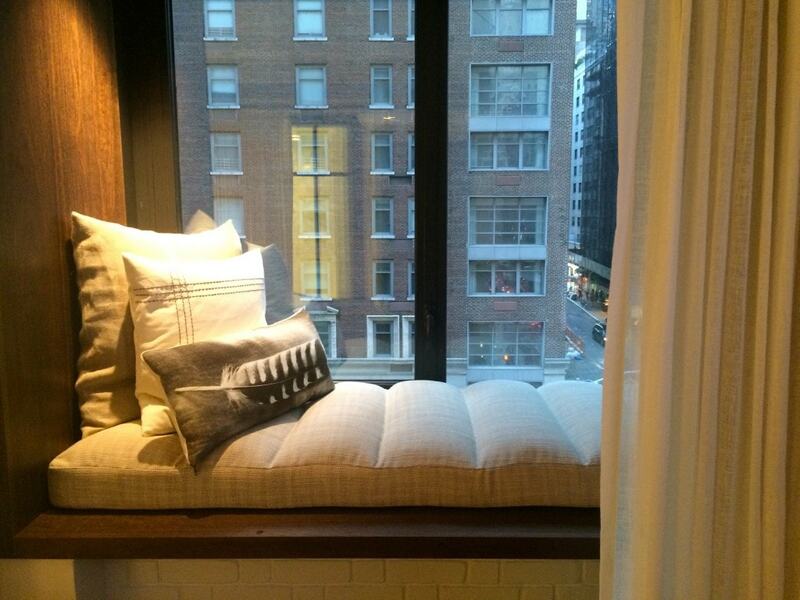 Cool feature: Some of the rooms have window seats, a fun place to read and watch the city life below you. 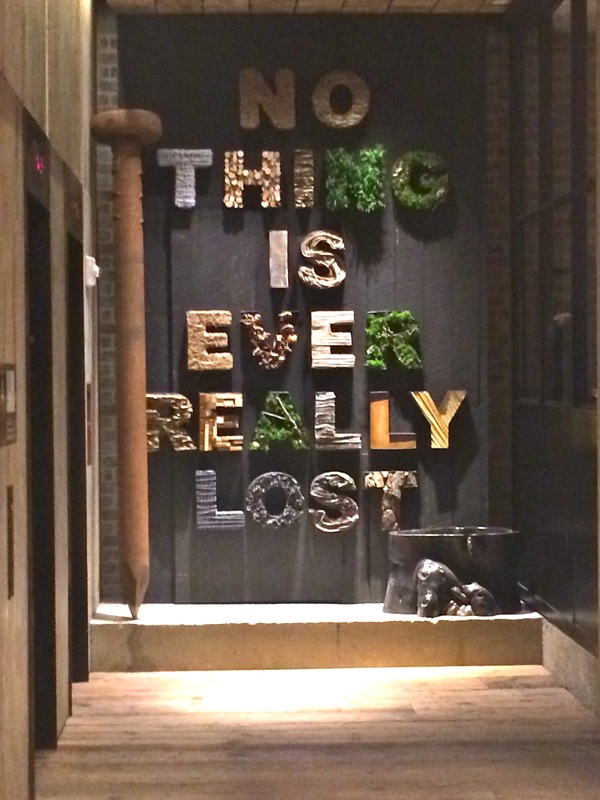 The wall art in the lobby is thought provoking and interesting. The lobby makes you want to linger here. 1 Hotel offers a farm stand daily with fresh fruits, nuts and granola in their nature-inspired lobby. 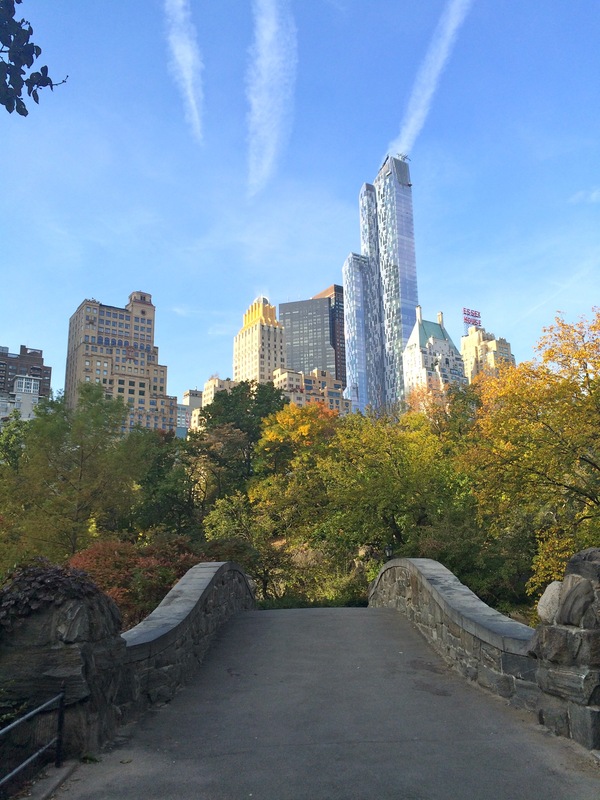 The best thing about 1 Hotel Central Park is its location. 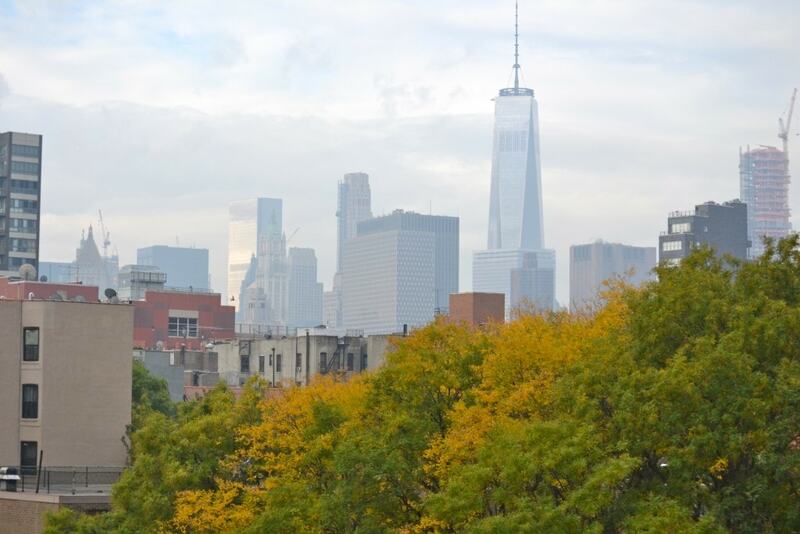 It is walking distance to Central Park which makes it the ideal spot to stay if you like to start your day off with a run or peaceful walk through the park. 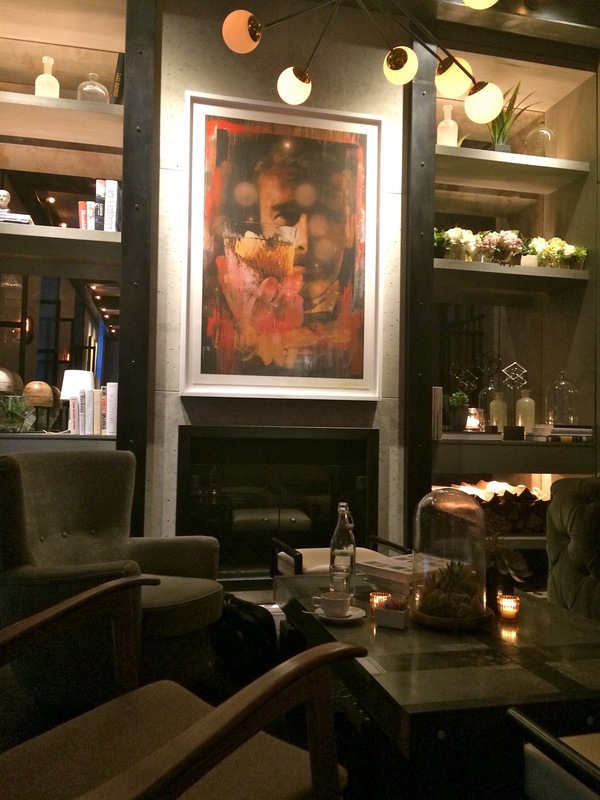 Th Dream Downtown hotel is an architectural delight with an artistic surprise around every corner. 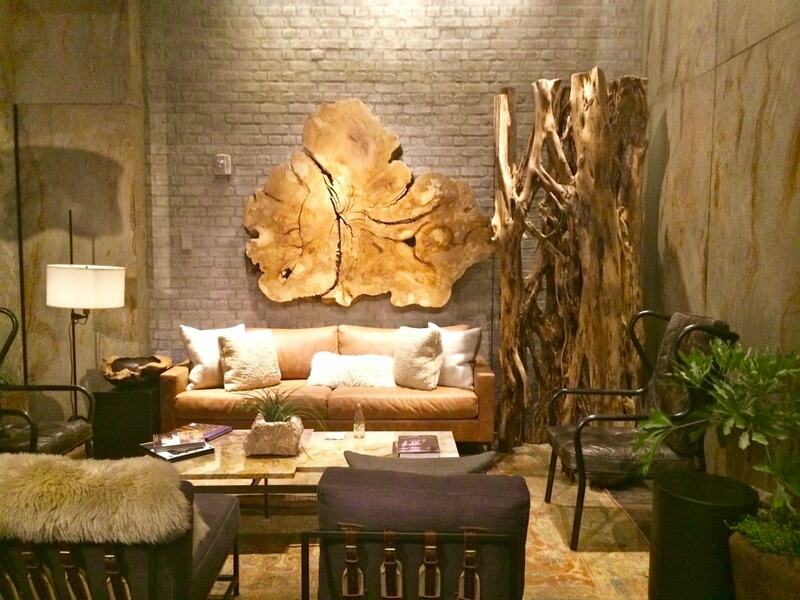 The lobby design makes you want to sit and stay a while. 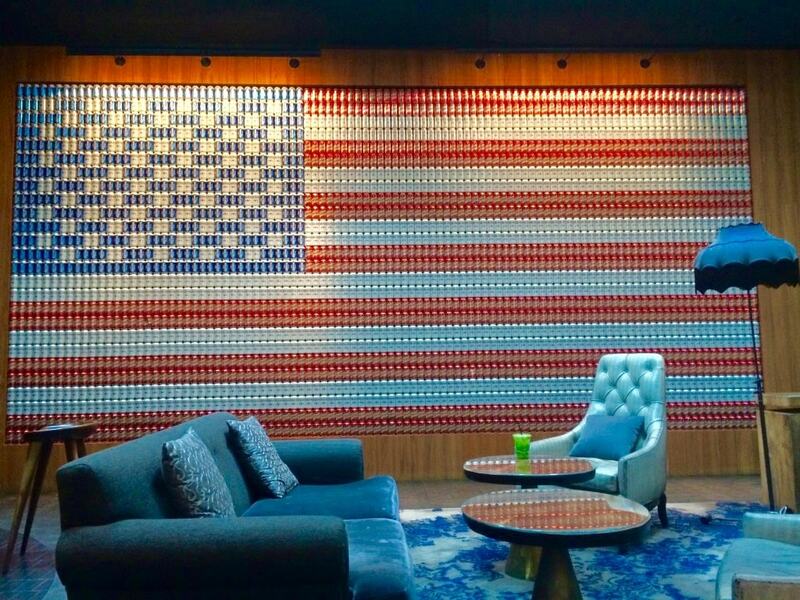 You have a choice between a spot under this amazing flag or this outdoor garden area. 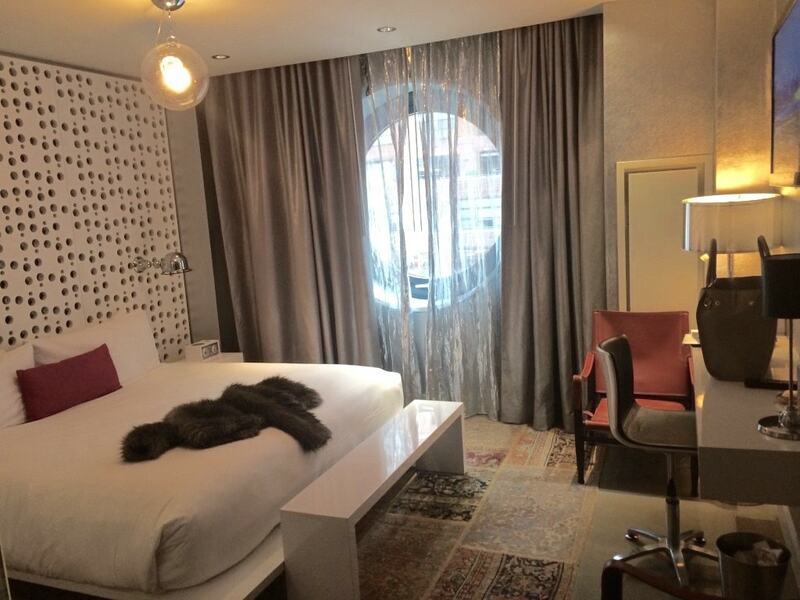 The rooms are a comfortable size and the patchwork rugs really make you feel at home when you walk in. 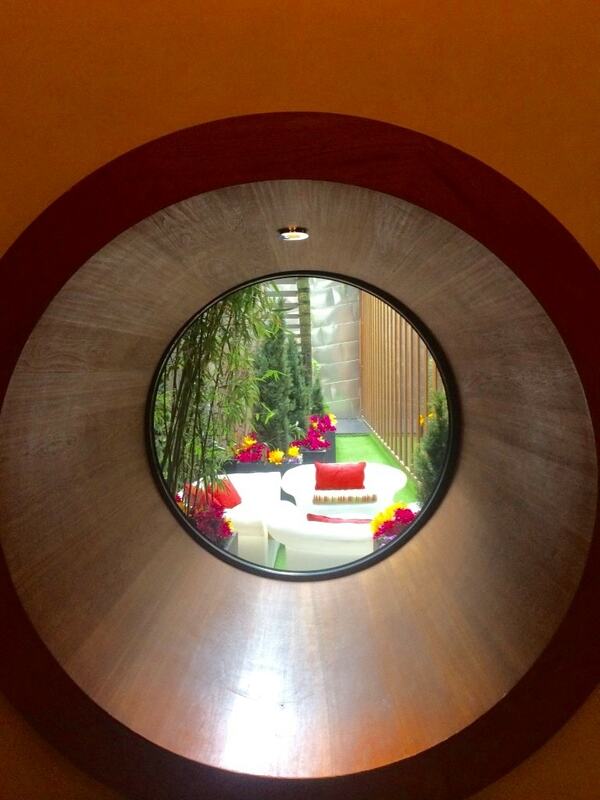 The windows in all the rooms are round, like portals offering a glimpse into the outside world. 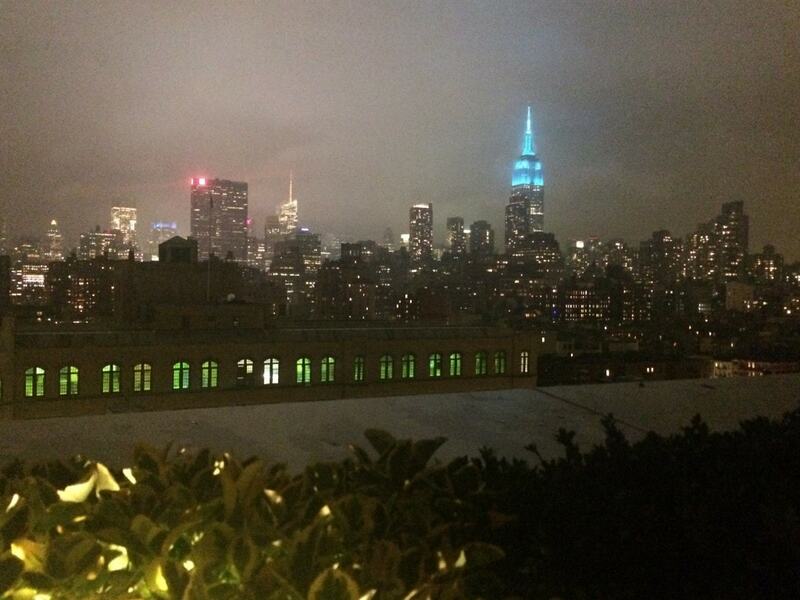 Best Feature: Dream Downtown has a rooftop bar with a great view of the city. Perfect for taking those skyline photos you crave. 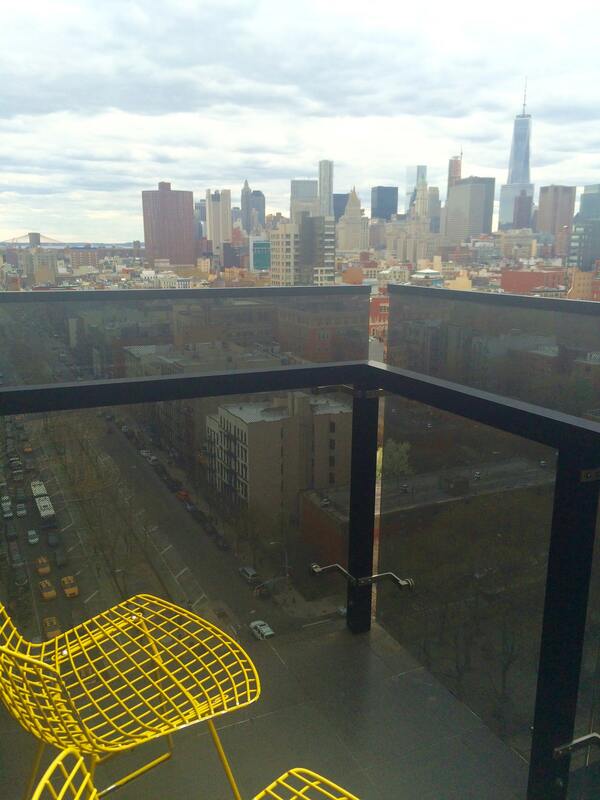 The rooms are the highlight of the Sixty LES with their hardwood flooring and floor to ceiling windows. 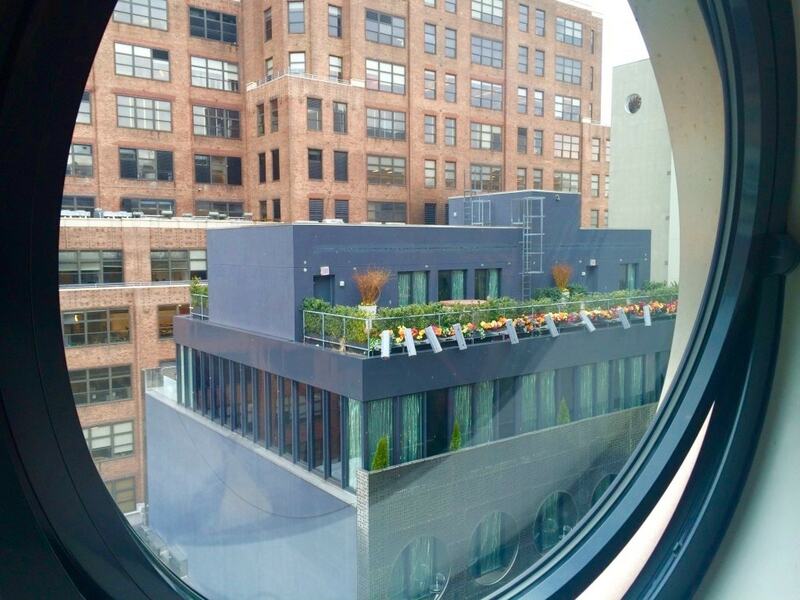 The Sixty LES features rooms with a wrap-around balcony, perfect for getting some fresh air on a crisp evening. And you can’t beat fall views like these. You can input your dates and the hotel of your choice into the Booking.com widget below to find discounted rates on these luxury hotels. My experience is that deals on these hotels go fast so if you find a good price for your dates, book your inspirational trip to NY today! I’m confident you will come back with some new ideas for your own home decor.